Therefore, Pronal developed custom solutions with inflatable grippers for palletizing and de-palletizing of bottles and flacons. Our teams can also design and manufacture pneumatic grippers to meet your specific needs. «We have been using Pronal products for over 10 years. Before that we had semi-automatic de-palletizers operated by one person. During the process of our growth, we acquired two new automatic de-palletizers with a capacity of 12000 bottles per hour and the ability to pick up new bottle shapes. During this phase, Pronal helped us to define the suitable grippers and optimize the necessary quantities. 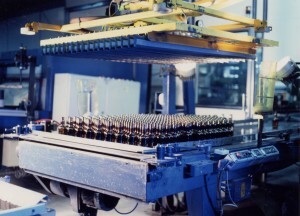 In our program we have 15 bottle shapes that require only 3 models of grippers. In some cases we only need to adjust the spacing.